Just as the journey of a thousand miles begins with a single step, the journey toward measuring your content marketing ROI starts with a single area. It’s a first step that 28% of B2B marketers aren’t taking — they say they aren’t measuring the ROI of their content efforts, according to CMI’s B2B Content Marketing: 2017 Benchmarks, Budgets and Trends — North America. However, of those who characterize their content efforts as the most successful, 87% are tracking the ROI of their content during at least one phase of the buyer’s journey. Complete measurement of your content’s performance is definitely a thousand-mile journey, but a single category is all it takes to get started. In the end, your own ROI measurements will depend on what “R” you’re after. In other words, before you start measuring anything, you first need to determine what you’re hoping to achieve by creating content. To help get a handle on content ROI and how to start nailing it down, we corralled a panel of B2B content luminaries during Content Marketing World. Check out their suggestions on where to start, and follow along in the video for even more nuggets of wisdom. Measure audience size and behavior through top-of-funnel content? Experiment with purchase-driving content at the bottom of the funnel? Identify pain points in your conversion process, and measure those? Map each piece of content to specific goals? Skyler’s team at HCSS started out as part of the 28% that doesn’t track their content ROI, even publishing content without mapping it to a particular persona. The HCSS team knew something needed to change, so it focused on creating top-of-funnel content and carefully tracking how it generated marketing-qualified leads (MQLs). With some diligent planning and lots of learning, the content now generates so many qualified leads that the sales team can’t keep up with the lead flow. Basic tools tend to suffice for measuring top-of-funnel content because at this stage you’re primarily concerned with building up the size of your audience and encouraging them to move closer toward a purchase. 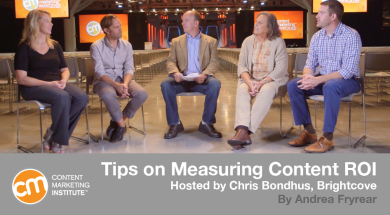 Google Analytics may be all you need to effectively gauge your content’s performance. But don’t fall into the trap of measuring page views alone; this single data point won’t tell the whole story of your content ROI. Remember, your measurement objectives should be tied to what the “return” in “return on investment” means for your organization. For Skyler’s HCSS team, return meant monitoring how many leads each piece of content produced. For others looking to improve engagement, the concern might be how long the audience spends consuming content as measured by time on page or a video’s play time as a percentage of its total run time. For Dusty from Autodesk, early efforts at proving ROI were simpler when focused closer to a purchase. At this point in the buyer’s journey, fewer steps exist between when the lead interacts with content and makes a final decision to buy. You also likely already have more information about these leads in your pipeline. Dusty suggests that when audience members’ behavior shows strong signs of interest in the solution you’re offering, you present half of that audience with a piece of content. This might be an e-book download, a webinar invitation, or a social media interaction; the important thing is that it’s designed to push them toward a decision. Evaluate how the half of your audience provided with decision-driving content converts as compared to the other half of the audience that received no content. If the content group turns out to be more likely to ultimately become customers, you have a clear indicator of your content’s ROI. Type A Communication’s Carla suggests that you focus your measurement efforts on pain points, which may appear at different points in the sales funnel. Start where it hurts the most. Where is it that people are struggling? Is it to get people to understand the brand, to better prepare people for those first conversations? Or is it a hard time converting at the end? While these questions might drive you to investigate content ROI at the top or bottom of the funnel as they did Dusty and Skyler, they might push you to track content performance for post-sales activity. Or, your conversion bottleneck might show up at the middle of the funnel. Your content marketing as a whole should be driven by large-scale, macro goals (like increasing content-related conversions quarter over quarter), but each individual piece of content should have its own goal, too. Marketing Interactions’ Ardath told us that during her workshop at Content Marketing World, she challenged attendees to assign a goal to each piece of content. It was, she said, far and away the hardest part of the exercise for many participants. Many of us, unfortunately, aren’t used to giving our individual pieces of content goals beyond achieving a certain number of page views. Even if your goal is simply to drive someone from one piece of content to another, you need to establish that in advance so you know what you should be tracking. Consider what you want your content as a whole to achieve — whether it’s to increase brand awareness or to build up a subscriber base or drive more purchases — then work backward and make sure you can track each step toward those goals. What stages does my audience go through before making a final buying decision? Where is the bottleneck in that decision flow right now? If we create content to help alleviate that pain, what metrics will show that it’s working? Do we have the tools needed to provide data on at least a few of those metrics? Have we clearly identified the macro and micro goals for our content? Is the process of tracking content’s progress toward those goals explicit and clear? What have you found to be the best first area to measure for successful content marketing efforts? Want more insight in what successful B2B marketers do differently with their content marketing? Read the full report, B2B Content Marketing: 2017 Benchmarks, Budgets and Trends — North America. Andrea is the president and lead trainer at AgileSherpas, a training, education, and consulting company designed to help marketing teams transform their work from frantic to fantastic. Her most recent book, Death of a Marketer, chronicles marketing’s troubled past and the steps it must take to claim a more Agile future. She geeks out on all things agile and content on Twitter.